In the context of a complete makeover of their biggest meeting room, Dow renewed their audio infrastructure as well. They opted for TeamConnect Ceiling, a modern system that guarantees smooth and disturbance-free transmission without the need for regular maintenance. On a regular basis, employees based at Dow Europe GmbH’s Swiss headquarters in Horgen meet their colleagues working for Dow all around the world in virtual conferences. In the past, these global meetings did not always run smoothly; Facility Manager Sandra Stadler, responsible for audio-visual equipment, reports: “Quite often, international colleagues asked their Swiss counterparts to speak up or repeat what they had said because of transmission problems. " Both preparations for meetings, and the meetings themselves were made complicated by too many cables and table microphones. Reorganizing the room and moving tables meant a lot of work because of the audio equipment that had to be repositioned. Profile Dow in Switzerland is part of the renowned American chemical company The Dow Chemical Company. Switzerland is home to Dow's regional headquarters in Europe, the Middle East, Africa and India. 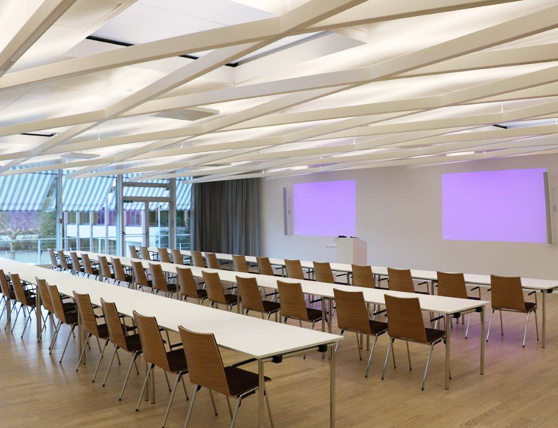 When Dow in Horgen decided to completely renovate their largest meeting room of 80 square meters, they saw the chance to have their audio equipment renewed as well. The company opted for several modules of Sennheiser’s TeamConnect Ceiling. The inspiration to use this innovative conference system came from their system integrator Supravision with whom they already had good experiences. The ceiling modules are each composed of 29 omnidirectional microphones that automatically identify the loudest speaker in the room. This is beneficial for the smooth running of meetings - neither do people have to sit at specific ends of the room nor are they obliged to bend towards a table microphone to be understood by conference participants at the other end of the line. Dow’s employees can now concentrate fully on the content of their meetings without being side tracked by loose cables or sight-blocking microphones. What’s great as well is that employees themselves can be responsible for organizing meetings without the technicians’ assistance. “It really is very simple, “Sandra Stadler says. “I gave my colleagues one short introduction and from that moment on, everything’s been running smoothly, without us technicians being involved. We can fully concentrate on other crucial tasks now. Everything can be launched with one single push of a button. What’s more, our tables are free and look much nicer without bulky microphones.” For in-house conferences in the same room, Dow purchased three headsets and three handmics of Sennheiser’s SpeechLine Digital Wireless series. They, too, work without cables and single-use batteries. Their rechargeable battery units have a running time of several hours before they need to be placed in charging sockets that quickly prepares them for their next use. During the renovation of their meeting room, Dow added a small closet adjacent to the room that serves both as a control center for TeamConnect Ceiling and as a storage room for the microphones, receivers and sockets. Now all the equipment can be found and stored away easily during the daily hustle and bustle of a large international company. “The charging sockets for the wireless mics run perfectly well and definitely facilitate our lives “, Sandra Stadler concludes. Take your meetings to the next dimension.